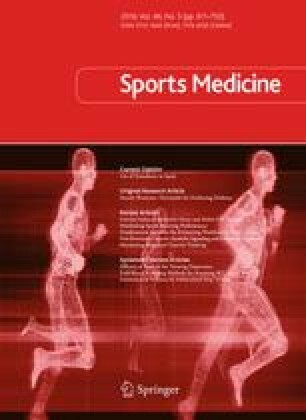 The aim of this review is to investigate methodological concerns associated with sprint performance monitoring, more specifically the influence and magnitude of varying external conditions, technology and monitoring methodologies not directly related to human physiology. The combination of different starting procedures and triggering devices can cause up to very large time differences, which may be many times greater than performance changes caused by years of conditioning. Wind, altitude, temperature, barometric pressure and humidity can all combine to yield moderate time differences over short sprints. Sprint performance can also be affected by the athlete’s clothing, principally by its weight rather than its aerodynamic properties. On level surfaces, the track compliance must change dramatically before performance changes larger than typical variation can be detected. An optimal shoe bending stiffness can enhance performance by a small margin. Fully automatic timing systems, dual-beamed photocells, laser guns and high-speed video are the most accurate tools for sprint performance monitoring. Manual timing and single-beamed photocells should be avoided over short sprint distances (10–20 m) because of large absolute errors. The validity of today’s global positioning systems (GPS) technology is satisfactory for long distances (>30 m) and maximal velocity in team sports, but multiple observations are still needed as reliability is questionable. Based on different approaches used to estimate the smallest worthwhile performance change and the typical error of sprint measures, we have provided an assessment of the usefulness of speed evaluation from 5 to 40 m. Finally, we provide statistical guidelines to accurately assess changes in individual performance; i.e. considering both the smallest worthwhile change in performance and the typical error of measurement, which can be reduced while repeating the number of trials. Thomas Haugen and Martin Buchheit declare that they have no conflicts of interest relevant to the content of this review. Informed consent was obtained from the individual participant for whom identifying information is included in this article. International Association of Athletics Federations. Competition rules 2014–2015. http://www.iaaf.org/about-iaaf/documents/rules-regulations#rules. Assessed 5 May 2015. Hopkins WG. How to interpret changes in an athletic performance test. Sportscience 2004;8:1–7. http://www.sportsci.org/jour/04/wghtests.htm. Accessed 1 Oct 2015. Hopkins WG. Precision of the estimate of a subject’s true value (Excel spreadsheet). In: A new view of statistics 2000. sportsci.org: Internet Society for Sport Science, http://sportsci.org/resource/stats/xprecisionsubject.xls. Accessed 1 Oct 2015.